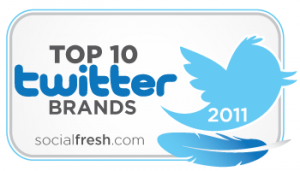 Over a month ago we kicked off nominations for the Top 10 Twitter Brands. We received over 150 nominations and last week narrowed it down to 24 finalists. We did the same thing earlier this year to put together our list of 2011 Top 10 Corporate Blogs. The goal of these user nominated awards is to help find best-of-the-best examples of businesses using Twitter for real results. We reviewed every account nominated and judged them on their engagement/audience metrics. Then our judges graded the finalists subjectively on entertainment, conversion, and engagement. The combined scores, objective and subjective, brought us to our winners today. Please congratulate all the nominees and the winners on Twitter. We have teamed up with 4 industry thought leaders on Twitter and business as our esteemed judges. We actually have a top 12, not a top 10. Our judging criteria resulted in five blogs with a tied score for the final and 8th place. All are worthy of highlighting, so the list was expanded by two. Let us know what you think of the results in the comments. Who is your favorite of the above winners?